My 1 1/2 year old loves when I read him this story, but he wants to grab at the book and the pictures; so the book is a crumpled mess. I wish it was cardboard; hense the 4 stars instead of 5. But the story is fun for us to read together and he loves the colorful pictures. There is just enough story to give us our 15 or 20 minutes reading time before bed. There is so much in the pictures to share, that we can easily extend that reading time to 30 minutes, or more, during the day. My daughter is 2 1/2 and she loves this book. Some nights she will want me to read it 5 times in a row. The pictures are colorful and catch her attention and she loves to study them. The rhyming in the book also is fun and she likes to help say the last words of each section. The book is also very inexpensive so I have found it to be a great buy. There is not too much wording on each page, just the right amount. 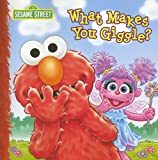 We bought another sesame street book at the same time that has lift the flaps, but we don’t even really read it because there is too much text and my daughter gets bored. Anyways, get this book, it doesn’t cost much, it’s cute and fun! OK – the rhymes are a bit goofy, but we bought the book for our two year-old who loves anything Abby Cadabby. It’s a hit with her so that makes us happy.